Buffalo Bill Sues a Steamboat Company. A very interesting petition was filed this afternoon in the United States Court. The plaintiffs in the case are a company whom almost every American child knows. They are Adam H. Bogardus,  William F. Cody and Nathan Saulsbury, doing business under the name of "The Buffalo Bill Wild West Show." It will be remembered that the show was here during the latter part of November last. It then entered into an agreement with the Tacomo Packet Company to convey the whole combination to various points, and finally to land it in New Orleans. For this the Buffalo Bill Company was to pay the Tacoma Company $400 a week. The latter agreed to bring the troupe to their respective places on time and in safety. 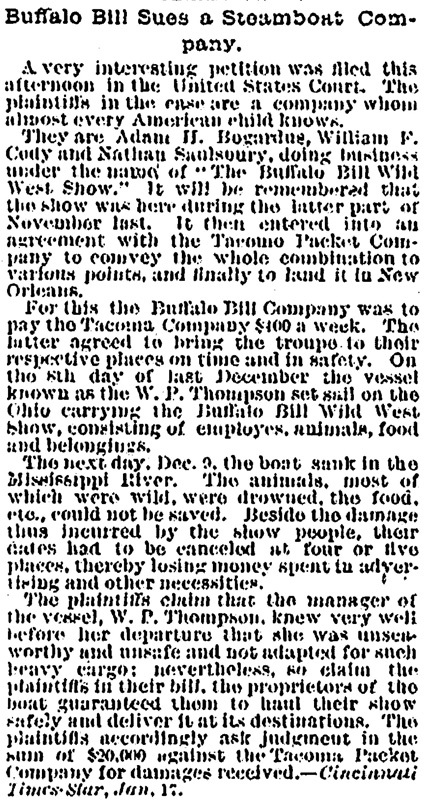 On the 8th day of last December the vessel known as the W. P. Thompson  set sail on the Ohio carrying the Buffalo Bill Wild West Show, consisting of employes, animals, food and belongings. The next day, Dec. 9, the boat sank in the Mississippi River. The animals, most of which were wild, were drowned, the food, etc., could not be saved. Beside the damage thus incurred by the show people, their dates had to be canceled at four or five places, thereby losing money spent in advertising and other necessities. The plaintiffs claim that the manager of the vessel, W. P. Thompson, knew very well before her departure that she was unseaworthy and unsafe and not adapted for such heavy cargo; nevertheless, so claim the plaintiffs in their bill, the proprietors of the boat guaranteed them to haul their show safely and deliver it as its destinations. The plaintiffs accordingly ask judgment in the sum of $20,000 against the Tacoma Packet Company for damages received.—Cincinnati Times-Star, Jan. 17.